To illustrate the difference in signal loss, we see that at 20 GHz, 1000 meter of SM Fiber has 7,500 less loss than 0.15” RF cable. 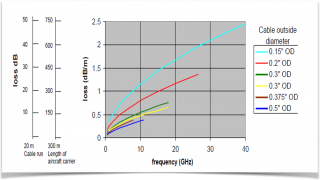 As shown in the graph below, the optical cable loss (single mode) is around 0.25 dB/km, while in the RF domain, the optical loss translates to ~0.5dB/km. Since deploying fiber technology is complicated, RFOptic has developed RFoF solutions that are customizable to enable maximum flexibility for its customers. One of our customers, the US Naval Research Laboratory (NRL), tested RFOptic’s programmable RFoF and compared it with the performance of copper. In May 2017, RFOptic celebrated its 100th deployment of its programmable RFoF solution. Following this success, successful tests were completed by the US Naval Research Laboratory (NRL), underpinning the effectiveness of RFOptic’s programmable RFoF. Let’s have a closer look at some of the test results. The test results showed that RFOptic’s RFoF can replace coaxial cables without degradation of RF performances. The RFoF link even outperformed the copper link in one of the tests. As shown below, the Quadrature Phase-Shift Keying (QPSK) constellation test proved that the RFoF clusters were more compact than the copper clusters.